Philosophy is typically regarded as a discipline full of wordy abstractions and complex theories bereft of life, action and practicality. However, this dominant paradigm forged by the academy over the past few millennia, has covered up another philosophy — a practice of philosophy whereby experimental thinking methodologies are created and enacted. 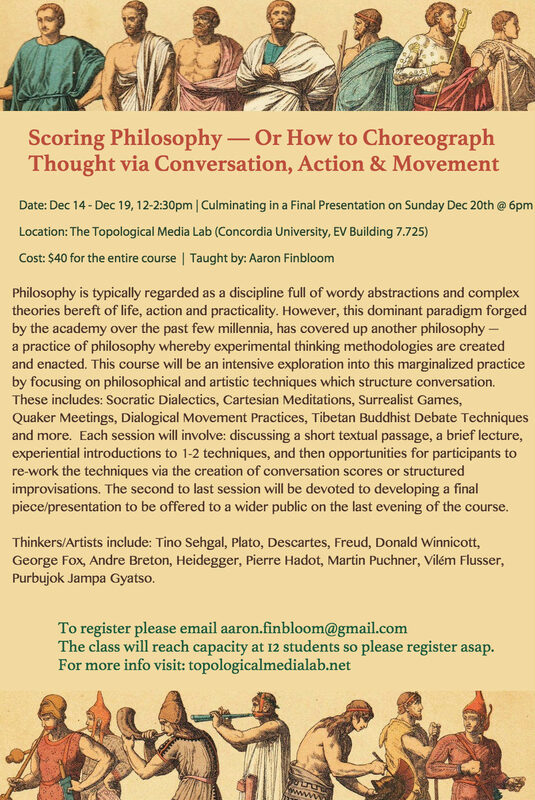 This course will be an intensive exploration into this marginalized practice by focusing on philosophical and artistic techniques which structure conversation. These includes: Socratic Dialectics, Cartesian Meditations, Surrealist Games, Quaker Meetings, Dialogical Movement Practices, Tibetan Buddhist Debate Techniques and more. Each session will involve: discussing a short textual passage, a brief lecture, experiential introductions to 1-2 techniques, and then opportunities for participants to re-work the techniques via the creation of conversation scores or structured improvisations. The second to last session will be devoted to developing a final piece/presentation to be offered to a wider public on the last evening of the course. George Fox, Andre Breton, Heidegger, Pierre Hadot, Martin Puchner, Vilém Flusser, Purbujok Jampa Gyatso. The class will reach capacity at 12 students so please register asap. Aaron Finbloom is a philosopher, performance artist, musician and co-founder of The School of Making Thinking (SMT), an artist/thinker residency program and experimental college. Much of his work involves re-kindling the connection between the philosophical and the performative by creating quasi-structured conversations through games, improvisational scores, booklets, audio guides, dance maps, theatrical lectures, existential therapy and philosophic rituals. Finbloom has taught philosophy at Suffolk County Community College, curated dozens of courses playing with radical pedagogy for SMT, and led numerous interactive workshops at places which include: EMERGE Residency Program, The Performance Philosophy Conference, Elsewhere, and Milk Bar. Finbloom holds an M.A. in Philosophy and Art from SUNY Stony Brook and currently working towards his PhD at Concordia University’s Interdisciplinary Humanities program.